A sign that Ocean View Church of Christ had hoped to erect outside the church received negative feedback from the Town’s Board of Adjustment, so the church withdrew their application. George Keen presented the request on behalf of the church, which wished to erect a free-standing double-sided sign that would be approximately 16 feet high and 16.4 feet wide. The church had sought a variance to exceed the maximum per-side total square footage of 24 square feet, seeking to double that to 48 square feet. They had also sought a height variance of 4 feet, as the Town’s code permits a sign’s maximum height to be 12 feet. 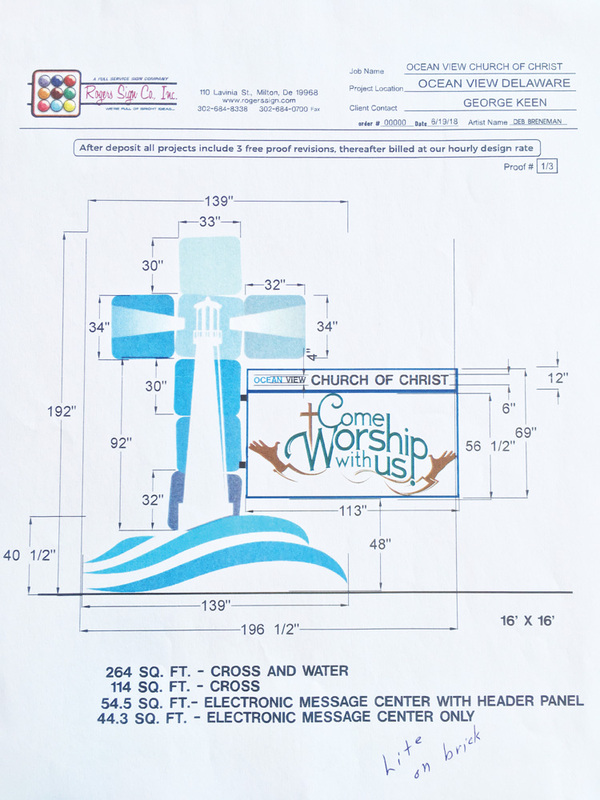 Lynn Rogers of Rogers Sign Co. spoke on behalf of Church of Christ, explaining that the sign was designed to resemble the church’s new logo (a lighthouse within a cross, with waves below). “It’s appealing, it’s functional, and goes with the character of the neighborhood,” he said. The sign, as proposed, would include an electronic message center where messages could be controlled remotely, which Rogers said the church would gladly share with the Town in emergency situations, such as a hurricane. Rogers said that, with the widening of Route 26 and a signal box, the church’s current sign (which is part of a brick flagpole setup) is now “dwarfed.” He noted that the church would keep the flagpoles but remove the “Ocean View Church of Christ” lettering. Rogers said the church sought to exceed the height limit imposed by the Town code due to the majority of vehicles on the road today being SUVs. The size of the sign concerned some of the board members, though. “The signage that tells you that it’s the Church of Christ is smaller than the sign on the brick wall,” noted Board Member John Reddington. “It’s just got a humongous presence about it,” said Board Member Greg Neuner. BOA Chairwoman Susan Kerwin asked if the church would consider simply erecting a rectangular sign without the church’s logo being such a focal point. Neuner said that he understands the church’s desire to share its message, to which he said he has no objection, but that he believes the size of the sign could change. “It’s too prominent, based on what I’m seeing in the picture,” added Board Member Don Walsh. Ocean View Church of Christ subsequently withdrew their application, with the option to return to the board with a new application. They had initially hoped the sign would be built by the Christmas holidays. Lord Baltimore Elementary School had more luck with their signage variance request on Sept. 20, receiving approval for an illuminated LED sign. The sign will be 11.25 feet by 10 feet, with a total sign area of 232 square feet. Webb said the district wanted to create an aesthetically pleasing sign, “something plain and simple” but nice, that would easily provide messages to the community. She noted that the school would allow for the Town’s use of the sign for public safety messages. Webb said the brightness of the sign could be reduced automatically during the evening hours and that the messages would be static. The board voted unanimously to approve the variance.